When typing out a resume, you have to think about what your audience is going to be looking for. A resume should have a clear objective and be focused and organized. You should list all of your relevant skills and experiences as well as qualifications in your resume, but only the ones that are relevant. When you need to make a good first impression without being present, your resume should speak for you; the tone and layout of this resume should be the first word to let you in the door. If you feel that your current resume does not achieve this, do not despair, you just need to regroup and look at a few points on your resume that can be improved on. With each failure comes a lesson and experience, and this is what you can draw on to make a success out of applying for a job. What Is The Objective Statement? After introducing yourself with your name and personal details, you should add a section for your objective statement. This should be kept to the point as well and should tell your future employer what your expectations are and what value you can add to their establishment. Where do you see yourself in the next few years in the field? What qualifications do you have that applies to the position? What type of organisation do you see yourself working for? Once you have answered these questions to yourself, you can outline them in your paragraph so that there is no false hope nor empty promises brought to the table, and you know that the organization you seek is the organization you are applying to. Your physical therapy resume should keep the attention of the interviewer instead of losing them in between many paragraphs that explain your life story in detail. When you keep your resume in point form, the interviewer will be able to scan through your resume for the key points he or she will be looking for and will not feel like you are wasting their time. When a section of your resume calls for the use of paragraphs, you should try to keep those short and to the point as well. Before starting, look in newspapers and on the Internet to see what it is that employers are looking for in a candidate. Rather than simply copying these points into your resume, use them as a guideline and structure your resume around these points while still being honest. The interviewer will immediately pick up on these points in your resume and call you in for an interview. When you let them see that you are the candidate that they have advertised for, your chances of success are far greater than hiding these points in between everything else you can do. Start off your resume with an opening paragraph that summarizes your strengths. These could include your moral values, qualifications, mental strengths and experiences. This paragraph needs to be to the point and in a formal tone to grab the reader’s attention and give them and overview of what they are about to read in the rest of your resume. This will give the interviewer not only information about where you have worked but also to what extent you did your duty and will tell them whether or not you are passionate about what you do. Being part of associations and having affiliations with social benefits will show that Physical Therapy is not only a job for you, but that you are dedicated to the field as well. When you join any professional associations you gain knowledge and experience from peers in this field and this raises your level of dedication and competence in the field which makes you a sought after commodity. When placing yourself in the employer’s shoes, you can understand that when receiving the first round of resumes it is near impossible to read though each on in detail to find the candidates who match their search criteria. When you look at the advert for the position, highlight these keywords in your resume so that when they scan over the resume, these words will stand out immediately and you will be called upon should you fit the profile of the candidate they are looking for. When setting up a resume, it is always a good idea to stick to a set structure. This keeps you focused on the basics and helps you to not stray off the subject. A structured resume helps the interviewer or future employer to pick out the talents, skills and qualifications they need in a candidate. If your resume does not follow a certain structure or it does not flow, it will confuse the person reading it and you will not be called in for an interview. It is advised to remember that you are not the only candidate out there and the competition for all jobs out in the market is very harsh. You need to find a way to make your resume stand out while still looking professional and adding a personal touch to it that introduces you and gets your foot in the door. Objective statement which tells them if you are the right person for the work before they get to where you have worked and what you have done. Qualifications and where you have studied to get these qualifications as well as any additional courses that you have done which could supplement your training in the physical therapy field. Work experience which tells them where you worked, how long you have worked there and what you did while you were working there. Each time you send your resume out, you should take the time to scan through it and compare it to the advertisement. If you were the establishment looking for a candidate, would you hire you? Be brutally honest with yourself when answering this question and should the answer to this be negative, then you should take the time to think about why you could possibly fail to qualify for the position and what you can do about it before you send your resume out. When Is The Right Time To Apply For A Position? Send your resume out to as many places as you can, because the right time is right now. There will never be a perfect time for you to enter the job market. Do as much part-time work in the field as you can as an assistant and add that to your resume so that you have at least some work experience to add to your resume. A lot of graduates struggle to find work because of their lack in experience even though they have all of the training they could possibly afford. If you are a graduate with now work experience, you could volunteer your services and work part-time. This will count in your favor on your resume because it shows your willingness to commit to the field before you even start and you will gain practical experience to add to the list. If you wait for too long, you may miss your golden opportunity to get a job at the establishment you have been dreaming of. Remember to keep record of where you sent your resume out to and which resume you sent so that you do not sound confused if they do call you to come in for an interview. Sending out a resume should not be a test of your literature skills. You need to keep it short and to the point. If there is too much detail and information in the resume you leave nothing to the imagination and there is then no need for an interview because they have seen all they want to see. Do not include any qualifications you may have done along the way that has absolutely nothing to do with the position you are applying for. While keeping your tone throughout the resume formal, you do want to give the interviewer enough information to want to call you in to hear more about what you have to say. Including information about what would make you perfect for the position and why you say so, gives them an idea that you have done your homework and you do not just count them among a number of places you threw your resume at. When your resume is on in hundreds of others, you may lose your position in the employment line because of the smallest detail. If you use a font that is difficult to read or makes your resume look strange or untidy, it may just put the company you are applying to off and your resume will be cast aside with so many others. Pay attention to the smallest details right up to how you spell the company’s name before you send them out. You can send as many of your resumes out as you like as long as you pay attention to where you are sending them to and how you are making this company believe you are the one they have been looking for. When a company places an advertisement in the paper or on the Internet, they already have an idea of what kind of person they want for the position. They are not simply going to give you a chance with the hope that you are a fast learner and that you can think on your feet. There are many experienced and qualified people out there looking for work that already know how to do the job and they will be picked before you are. Pay attention to the details in the advert and to the qualifications and the experience levels needed to apply. You need to look at it from their perspective and you can apply this to your own life as well. When you want your car to be worked on and it is your only mode of transport, you will not get someone off the street who will hopefully figure out how things work as he goes along. The same goes for the job market. You need to emphasize what you have done and focus on your strengths so that if you do have the right qualifications, you will stand out over the other applicants who have merely submitted their resumes in the hope that someone will give them a chance. Although the task of finding a job is a difficult one with many challenges, you need to keep focused on your end goal and realize that giving up is not an option. Your resume is not set in stone. As you evolve and grow in your career, so should your resume. 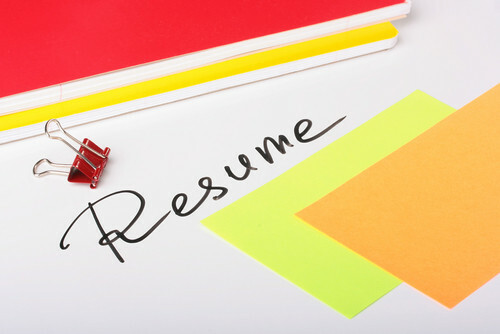 Even when you are not in the job market, keep your resume updated. You may never know when opportunity comes your way.